There is a great public interest to URGENTLY support a simple and quick remedy, to protect the most venerable tenants – the ones who struggle with their mental health. People who have emotional distress, chronic depression, anxiety and other variety of mental disturbances often find it difficult to cope with everyday life. The highest rates of suicides are associated with depressive disorder. More than, 6,00 suicides occur in the UK and Ireland each year. The Mental Health Foundation is an organization that boasts the benefits of caring for a household pet to remedy anxiety, depression, emotional distress and other mental disorders. Their combined research with Cats protection confirms value of “pet therapy” in suicide prevention and treating depression leading to it. 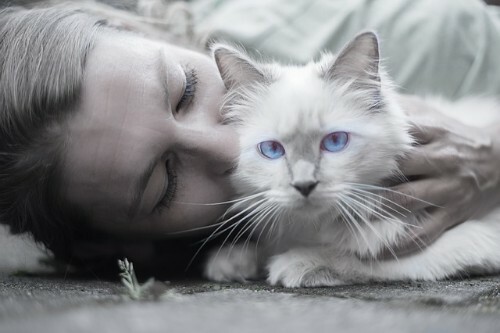 In 2011, a research was carried out by both organizations to study how owning a cat effects it’s owners mental health. 600 people took part, some of them cat-owners and some not. Out of all respondents, 50% confessed to have a mental health problem. Out of these, 9 in 10 admit that having a cat has a great positive effect on their mental health. 76% said their cat helps them cope with everyday life better. Emotional Assistance Pet Act is a petition started by Sophia Davenport, in order to grant the right to a personal pet to people who struggle with emotional distress, depression, anxiety and other mental health problems. The act would bypass any “No pet” clauses included in tenancy agreements and allow these tenants to have an assistant pet, much like the blind, who have a right to live with their guide dog. Over 7,000 disabled people in the UK rely on assistance dogs to help them complete various day to day tasks and have independence. In the private rented sector, landlords often choose to exclude pets in their properties and reject tenants who have one. According to Dogs Trust, 1 in 3 pet owners could not find a suitable property, while 47% of pet owners who used a lettings agency found them to be ‘unhelpful’. There is a wide scarcity for pet-friendly properties, so much that it’s become its own niche in the industry. Private landlords don’t want the extra risk, as many of them are just small-time property owners, who can’t afford to spend their whole year’s profits to repair and renovate a badly damaged property. BTL landlords also face restrictions from their mortgage provider and can’t allow pets in the property even if they wanted to. Letting agents don’t mind pets, but they involve more work and documentation and these costs get passed down to the tenant. What little landlords DO accept tenants with pets, often ramp up the rent and associated costs. It’s a standard practice for tenants with pets to pay an additional deposit to cover the costs for repairs and professional cleaning at the end of the tenancy. These tenants are also being scrutinised to a further extent, as to ensure the pets do not cause more damage than they can easily recuperate. To move with a pet means to pay a lot more money than without one. This puts tenants with depression and mental health problems at an even bigger disadvantage. The poorest 20% are 2.5 times more prone to develop mental illnesses than the richest 20%. What this means is that people facing challenges with their mental health most often don’t have high income and can’t afford to shell out a huge amount of money on pet deposits and higher rent. In 2005, the now abolished Officer of Fair Trading published a document called Guidance on unfair terms in tenancy agreements. It offered guidance into and common interpretations of the Unfair Terms in Consumer Contracts Regulations 1999 act. In table 4.2, an outright ban on keeping any pets is listed as an unfair term, if there has not been any consideration of the circumstances. Pet therapy is a very serious consideration more so if the pet is not bothering any neighbours or nearby residents. The guideline suggests that tenants should request permission to keep a pet in the property first, and the landlord should not “unreasonably” deny them. However, this is too vague and most tenants can’t use it to help keep their pets and their homes at the same time. It’s worth noting that when you keep a pet in the property without your landlord’s permission, you effectively break the tenancy agreement and the landlord can force you to either relocate the pet or take action to evict you. People with mental health issues have difficulties coping with regular life. An eviction is one of the most stressful events they can experience. Such a development will only worsen their wellbeing and mental health. The loss of a pet will be just as shattering to the tenant’s mental health as an eviction would. The owner-pet bond is proven to be as equally strong as between close family members. It’s a lose-lose scenario. Thus, these tenants cannot allow to let this scenario happen at all. This petition’s aim is to kick start a process, where the end result is a defined legislature that protects this incredibly vulnerable group of tenants and to propel a safe and positive method of battling day to day depression, anxiety and other mental disorders. By signing the petition, you will help the above become a reality. The initiative even received MP backing. The Emotional Assistance Pet UK page uploaded a photo last Thursday, of a letter by Grant Shapps MP, stating he will officially raise these issues with the Housing Minister Gavin Barwell MP and the Minister of the Department of Health, Nicola Blackwood MP. Pets don’t necessarily have to mean increase in costs for the landlord or an unmanageable hassle for letting agents. At The Tenants’ Voice, we believe that pets are as good as their owners. This means that good tenants will have good behaving pets and should not be unreasonably denied their company, especially when they are having a harder time dealing with daily life as it is.